Who is STILL Funding Federally Convicted Earlens CEO William M Facteau? William M Facteau, CONVICTED by a FEDERAL jury in connection w distributing adulterated & misbranded medical devices awaits FEDERAL SENTENCING pending a 2016 appeal. BOSTON July 2016– The former Chief Executive Officer William M Facteau and Vice President of Sales Patrick Fabian of Acclarent, Inc., a medical device company, were convicted by a federal jury in connection with distributing adulterated and misbranded medical devices. William Facteau, 47, of Atherton, Cal., and Patrick Fabian, 49, of Lake Elmo, Minn., were convicted by a jury following a six week trial of 10 counts of introducing adulterated and misbranded medical devices into interstate commerce. As taxpayers we’d like to think that once someone is federally convicted, on 10 federal counts, in 2016, that their sentencing would take place immediately, even pending an appeal. Nope, that’s way too logical and apparently not how it works, at least for Judge Allison D. Burroughs. Despite the best efforts of DOJ, FBI, FDA, DOD, CMS, a whistleblower AND a federal jury: William M. Facteau and Patrick Fabian remain free without accountability. HOW is FEDERALLY CONVICTED William M #Facteau still STILL holding #VentureCapital funded #CEO & #Board positions? In fact, quite the opposite, Facteau and Fabian’s fraud convictions have given them street cred in venture capital world located in the heart of Silicon Valley and Redwood City, CA. Federally convicted William M Facteau is currently CEO of venture capital funded startup Earlens and currently holds a board position at venture capital funded startup Procept Biorobotics, among his many impressive distinctions. Jun 5, 2017 Debt Financing – EarLens 1 $45M CRG L.P.
Vertex Ventures, CRG, Aisling Capital, Lightstone Ventures, and NEA (New Enterprise Associates) sure are trusting a criminal with a lot of money. 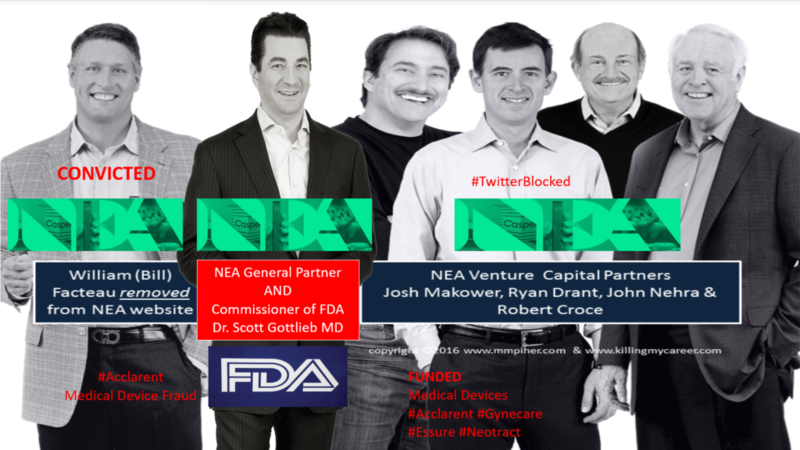 Federally convicted Patrick Fabian, currently COO of then venture capital funded startup NxThera which was acquired by Boston Scientific in March 2018. If you’re unhappy that convicted criminals are still being rewarded in the millions for their illegal behavior instead of being sentenced for their crimes please reach out to Judge Allison D. Burroghs and let her know. We all say we want to see change but seldom are willing to take even the simple steps to enact change. This one is easy. Just let the judge know you’d like William M. Facteau and Patrick Fabian sentenced pending their appeals. Nominated by Barack Obama on July 31, 2014, to a seat vacated by Rya Zobel; Confirmed by the Senate on December 16, 2014, and received commission on December 19, 2014.